Get a personalised nylon dog collar with ID tag. Sizes: 14-40 in (35-100 cm). Color: black. Personalised dog collar is a comfortable, reliable and necessary tool for dog walking with comfort and security. Secure your pet from loss with a collar with ID tag. This little, simple but special tool will help you to identify your dog. You may engrave dog name and your contact information at the metal plate and save yourself from worries. It will be the key to return your pet quickly in the case of loss. Such a small thing to do helps a lot. Nylon dog collar with ID is a perfect daily dog walking collar for powerful mastiff dog breed. Nylon dog collar is very strong and reliable. It is 2 ply, made of stitched nylon bands. Classic design with a buckle makes it reliable and easy in use. There are 5 holes to regulate the size of dog collar according to dog neck size. 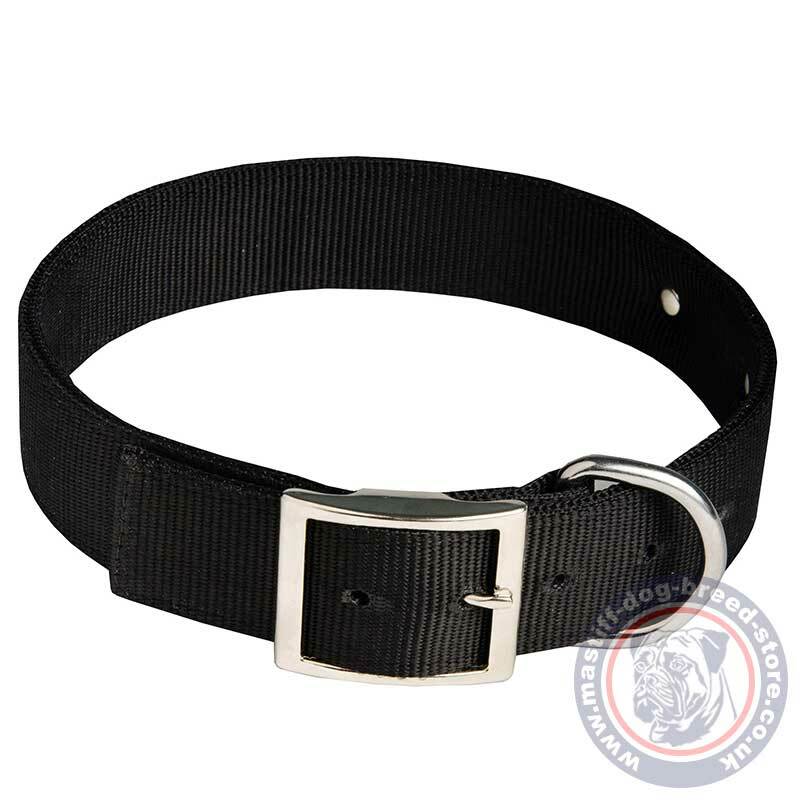 As usually, our buckle collar comes with a solid metal D-shaped ring for dog lead adjusting. 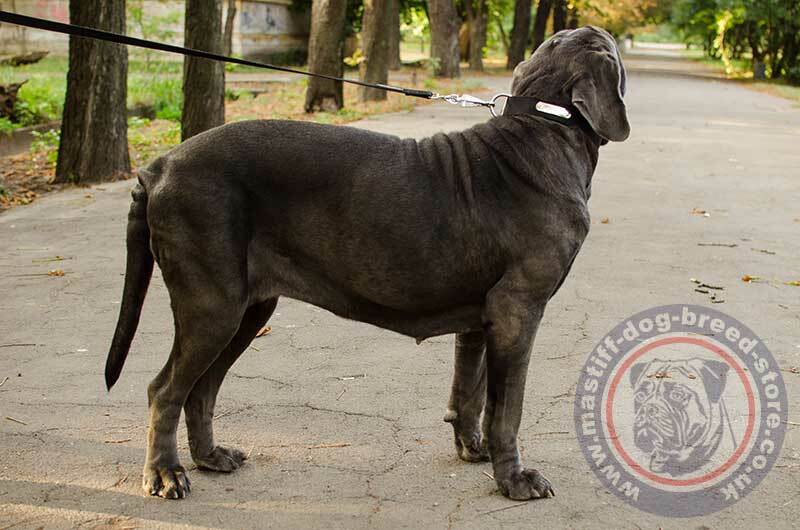 Mastiff collars are designed to be extremely strong to hold a powerful mastiff under control. Personalised dog collar is the first need tool in the colection of mastiff collars. Personalised dog collar with ID tag is certified. All the metal fittings are chrome plated and are distinguished with advanced rust-resistance. We made this personalised dog collar with ID of quality nylon to prevent stretching, wearing out and tearing. It will serve you for a long time and may be used regularly. Nylon dog collar with ID is extremely simple in storage and care. It is easy cleaned and quickly dried. Use nylon dog collar in any weather. Waterproof quality of nylon dog collar makes it an all-weather dog collar. Nylon dog collar with ID combines quality, reliability, functionality and reasonable price. 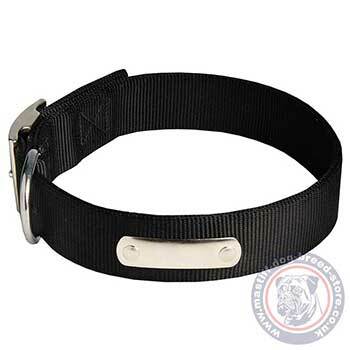 Nylon dog collar is light and strong and may be used both on mastiff pupies and adult dogs.